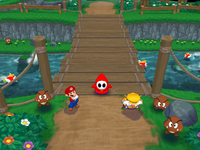 Bridge Work is a Duel minigame in Mario Party 7. 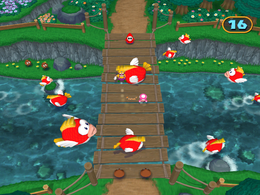 Both players are facing each other, and run away when a Cheep-Cheep jumps on the bridge. The object of the game is to stay on the bridge longer than the other player by avoiding jumping Cheep-Cheeps that knock the players into the water. After a short time, more Cheep-Cheeps jump, and large ones come as well. It is similar to another Duel minigame, Fish & Cheeps, except that it is on a bridge. Rules – "Avoid the Cheep Cheeps jumping over the bridge." Advice – "Watch out for the big Cheep Cheeps... They're hard to avoid!" Pukupuku rasshu! Cheep Cheep Rush! This page was last edited on August 9, 2018, at 18:03.